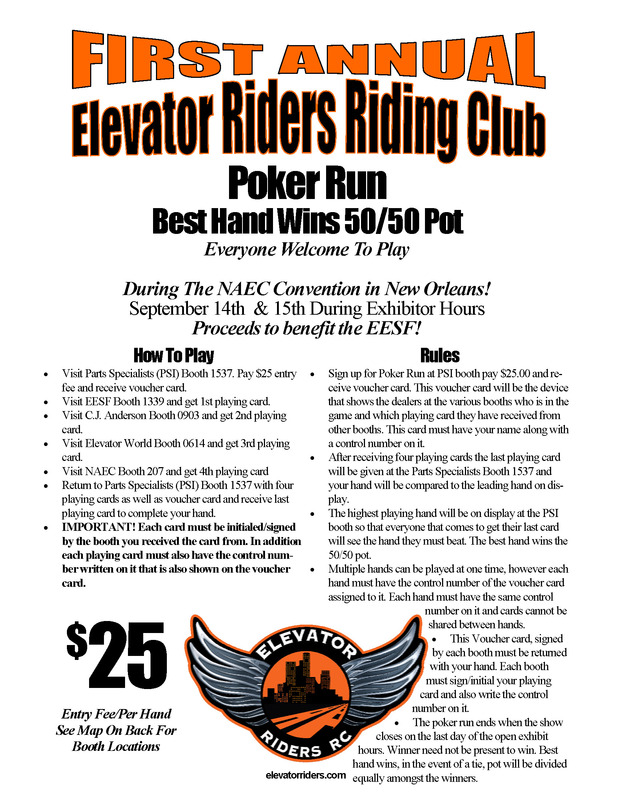 Elevator Riders Riding Club - Elevator Riders RC 1st Annual Poker Run "EESF"
Elevator Riders RC 1st Annual Poker Run "EESF"
During The NAEC Convention in New Orleans! · Visit Parts Specialists (PSI) Booth 1537. Pay $25 entry fee and receive voucher card. · Visit EESF Booth 1339 and get 1st playing card. · Visit C.J. Anderson Booth 0903 and get 2nd playing card. · Visit Elevator World Booth 0614 and get 3rd playing card. · Return to Parts Specialists (PSI) Booth 1537 with four playing cards as well as voucher card and receive last playing card to complete your hand. Click this link ERRC-2011-Poker-Run.pdf for complete rules and map!